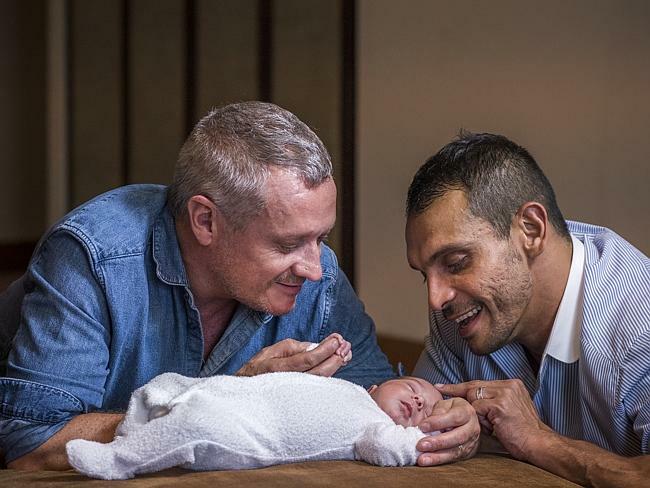 Fashion designer Jayson Brunsdon, and his partner Aaron Elias, welcomed their first child on January 5 and have named their son Roman Elias. Roman was born via a Thai surrogate, using an egg donated by a cousin, who will remain part of Roman’s life. Jayson is a former fashion editor for US Vogue and Follow Me magazine. He has worked as a stylist in New York and been creative director for Morrissey Edmiston. He launched his own label in 2004, and has stores in Sydney, Melbourne, and Singapore. His designs are available internationally at major stores such as Myer, Saks Fifth Avenue, and Harvey Nichols, while his collections have been shown at New York Fashion Week. Aaron is Jayson’s business partner; he and Jayson have been together for sixteen years. The name Roman was chosen to reflect strength and power – there were many obstacles in the way for Jayson and Aaron, and they feel their son had to fight his way to them. Jayson says, “… he is a fighter, warrior”. The middle name, of course, is Aaron’s surname.